The May Class III milk component prices and the Class II, III, and IV prices will be announced Friday afternoon - June 5, 2009. Will the prices improve? Unfortunately, no, they won't. While the final details for the calculation will not be available until Friday when the final last four weeks of data are available, we can look at the last four weeks that are available now to get a pretty good idea of where the prices will be. 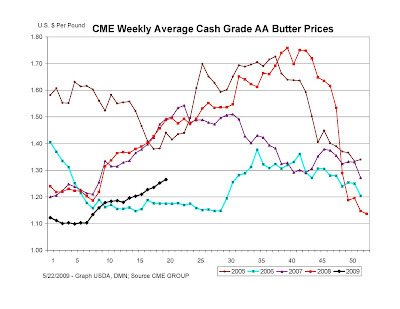 Therefore, the butter fat price should be near $1.23/lb, a slight improvement over last month. 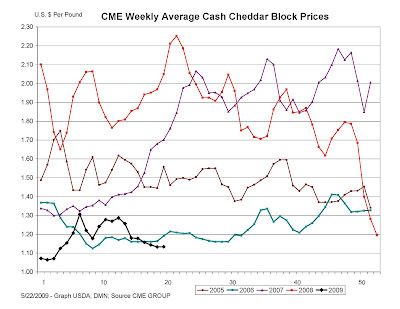 Given the four week NASS average for Cheese of $1.17 and Butter of $1.19 , that would calculate to a protein price of $1.81/lb, a very dramatic drop from last month. Class III milk price = 9.6 x Cheese Price + 5.9 x Dry Whey Price + .04 x Butter Price - $3.20. With Cheese at $1.17, Butter at $1.19, and Dry Whey at $.22, we can expect a Class III milk price around $9.38 a significant drop from last month's Class III price. The actual data will be slightly different once the four week averages are advanced two weeks and the final calculations are made, but it will be ugly. The final numbers and their impact on the long term trend and the milk pay check will be explored in the June 6 post.